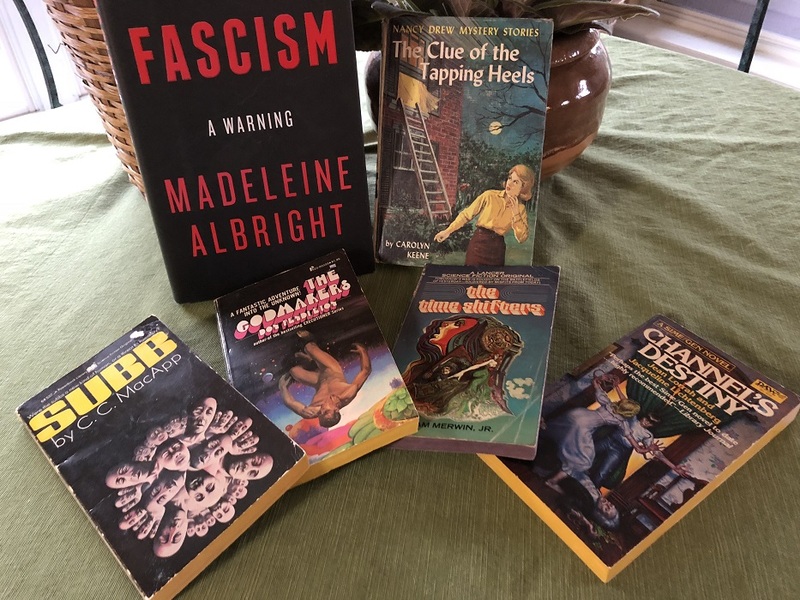 I went to the flagship Half Price Books after work yesterday, because I decided I wanted to do a tandem read/listen on Albright's Fascism. It's serious material, and the performance by the author is difficult to listen to. Some authors do great, even though they are not professional voice actors, but Albright is not one of those. Once I picked up the book I came for, I somehow found myself taking a *very* circuitous route to the checkout and accidentally browsing the shelves for other books. And I found a Nancy Drew that's missing from my collection, so of course I had to have that. Then I found one of their $3 bundles, where they wrap up 4 paperbacks with a ribbon and you get whatever's in there. The top book on the bundle was Subb. I mean, look at that fantastic vintage cover art. I was admiring it, and it somehow fell into my basket. My goal this year is to only buy 1 new bound book for every 2 that I read. I can justify not counting Albright's book, because it's just supplemental to the one I'm already reading. The Nancy Drew doesn't count, either, because it's an ongoing collection. But I had already bought 2 books, so for the year I'm at 6 books bought and 6 TBR shelf books read.